Global Harmony U.S.A Updates: Good news! Bus for Subuthi is Delivered! Good news! The Venerable Subuthi is now using the bus to transport water, food, and essential supplies to many poor villages in Sri Lanka. It took a long time to negotiate the import/export tax to ship the bus from Japan to Sri Lanka. Thanks to you and your support, we did it! Together, we make good thinks happen. 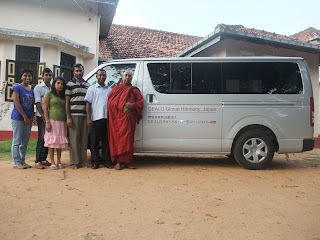 At last, the bus has been delivered to the Venerable Subuthi in Sri Lanka. It took a long time to negotiate the import/export tax issue. The Venerable Subuthi is now using the bus to transport food, water and supplies to many villagers in Sri Lanka. For more information about this project, view the March update and the first appeal. THANK YOU FOR SHARING, THANK YOU FOR CARING! Together, we make good things happen! In March 2011, a generous donor in Japan donated the funds necessary to pay for the taxes and shipping needed to deliver the bus to the Venerable Subuthi in Sri Lanka. Since the bus is now 1 year old, the taxes will be greatly reduced. Good news! Thanks to your support, we were able to buy the Venerable Subhuti a humanitarian vehicle. We are just a few short steps away from delivering this bus! After some serious car shopping, test driving, and careful negotiations to ensure the best deal. Cealo was able to buy this bus in mid-February 2011. As of mid-March, the bus is in storage at our supporter's place. He is taking care of the bus until the Sri Lanka tax is paid. Cealo continues his negotiations to pay for the car tax so we can deliver the bus as soon as possible. Thank you so much for all the previous support for this project from everybody and thank you for your understanding as we complete the project. We humbly request your continued support as we continue the fund raising until the bus is delivered.